Yesterday was an amazing day; we will remember the rest of our lives. The story starts in late September of 2008. I received a call from a mom in Wisconsin Rapids. 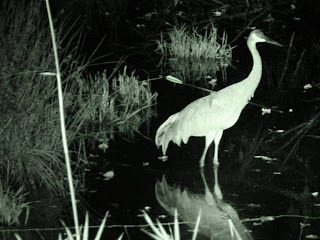 Her eleven-year-old daughter saw a sandhill crane with an arrow through its body. The bird standing in a stream skewered with an arrow was a horrifying sight and one this special child wanted to do something about. The girl insisted somebody do something to help this bird. Her mother called me at REGI. We’d heard about a sandhill shot with an arrow in the same area about a month before. A search was done at that time. The bird was not found and it was assumed the bird had died. That was not the case. By some miracle the bird had survived. However, a month later, the arrow remained in her body. The arrow had been shot though her back and exited her chest. REGI is about a two-hour drive to the site where the bird was located. I went to evaluate the situation. Catching a crane that can still run is difficult. The capture of a running crane with an arrow through it was even more challenging. I knew we could not use any traditional methods of capture such as nets. If the arrow moved while still in the bird, it could result in fatal bleeding. We came up with a plan. Many people were required for the plan to work. Nicki Christianson is a fellow wildlife rehabilitator and friend who lives in Wisconsin Rapids. Fortunately she has many contacts and friends that were willing to help. We met at a local convenience store near the site. Twenty- five plus people from all walks of life from farmers to professors were there. Each person was given a location and a cloth sheet. The idea was for the group to act like a giant purse string. Once the bird was located, the group moved forward putting increased gentle pressure on the bird until I could hand-capture her. The only hitch in the plan was that the bird made a last second break for it and headed right towards Carol Daily. Carol is a writer, woodcarver and taxidermist who came dressed to the nines for her 45th high school class reunion! She has a few health problems but wanted to help. I put her in a safe position. She would simply be a presence to prevent the crane from running to the area. Right… As luck would have it, the bird made a bee line directly towards Carol! I yelled and Carol rose to the occasion and made like a football player blocking a play. Her movements delayed the crane just enough to allow me to sprint the field with the speed of an Olympic champion and grab her! The female crane had a mate and a youngster in the field that September day. The male was protective and tried his best to shelter his mate and thwart our efforts. He and the juvenile flew off just before capture. Cranes haev strong mate fidelity. The male had to have been convinced his mate was no longer alive. The male and their chick migrated from the area a few days later. Once the bird was in my arms, my real work began. Very quickly we realized the crane could not be transported with the arrow still imbedded. The arrow had to come out in the field. My husband, a retired M.D., and Doug Christianson, local law enforcement officer, went to work cutting the arrow with pipe cutters to remove it. Another miracle was scar tissue had formed around the shaft of the arrow without adhering to the arrow itself. There was serious infection. The crane looked relieved. The crane was the image of grace under fire. She was calm, even cooperative. Odd, but she was an older female. She has expereince with the world. Once back at REGI we cleaned and irrigated the wound, did blood work, and tube-fed the crane liquid food. She was starving and would not be able to digest natural food. Just as a human patient if starving would not be able to digest a steak, she may well have died if given her normal diet during the first critical week. The crane remained calm, the picture of composure throughout critical care. In a few weeks the pseudomonas infection (one nasty bacteria) had resolved. 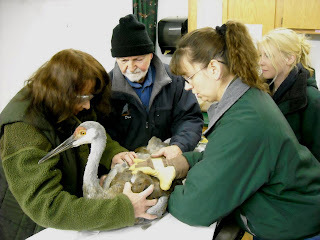 The injury site was healing and the crane was self feeding. It was time to take her from the critical care to an outdoor area. There she would have room to exercise and be with other sandhill cranes. We admitted six juvenile cranes last fall with various injuries that prevented their winter migration to Florida. Sandhill youngsters stay with their parents through the first winter. The young birds were therefore missing an adult presence in their life. Enter Arrow Mom. Arrow Mom is the closest thing to a name the crane had at REGI. In keeping with our protocol we do not name birds that are going to be released to the wild again. Arrow Mom did a masterful job of parenting this little group of juveniles. She nurtured and preened them when they needed it and separated quarrels with the developing “teenage” cranes when needed as well. She was perfect. The winter was brutal here in northern Wisconsin. We were all ready for spring. Arrow Mom was flying over our heads in the flight building. She was strong and powerful in flight. I was stunned that she could fly after the horrific injury and resulting infection. How could the muscle and nerves have recovered so completely? We quit asking why with this amazing bird and just began to expect the unexpected. 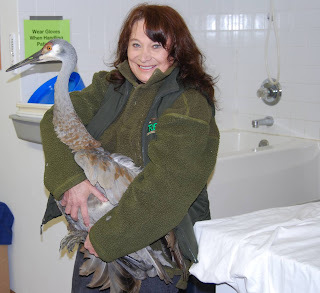 We received a call a few weeks ago that the male crane and the youngster were back on the territory where the female was captured. We began in earnest to prepare her for release. Wednesday April 1, 2009 was the date set. The day was cold, windy and snowing. I went to the flight near daybreak to observe the crane for one last time. All of our patients are special but this crane was carved into our hearts. Soon she would be free. I wondered if she sensed my excitement/angst. The youngsters Arrow Mom had mothered all winter stood quiet while we captured her. For the first time in her confinement she was anxious and vocalized her concerns. We did a quick exit physical and put her into a travel box for transit to Wisconsin Rapids. With any luck at all I will be the last human to touch this beautiful bird in her lifetime. A crowd of her admirers had gathered to celebrate her release. 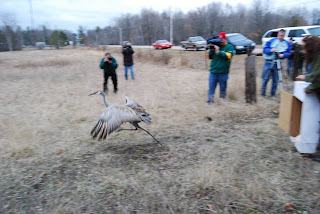 The community of Wisconsin Rapids that came together to help this miracle bird turned out to see her regain her freedom and to wish her well. The box opened and with the young girl that insisted on finding help for the intolerable situation at her side the crane took her first step to the rest of her life. She launched into the air and flew powerfully. Thirty seconds into her freedom a loud crane call came from the adjoining field. Arrow Mom called back and did a U turn. Within a few minutes after the crowd dispersed the crane family was back together, the final miracle of a story that seems too good to be true. We gave her a second chance at life. Now it is all up to her. We wish the family well and hope the community support has made an impression on a cruel, thoughtless and heartless person that decided a federally protected Sandhill crane would make good target practice. We are grateful to everyone that helped with this incredible case. She gave us back more than we could ever give her. Newspaper article from Wisconsin Rapids.